The Sigma EF-Mount Lens to Sony E Mount Camera MC-11 Adapter allows you to mount certain EF mount Sigma lenses to certain Sony E mount cameras. Please read our Notes tab carefully for full details on compatibility. This adapter provides fast and smooth AF for compatible lenses, maintains OS features, and maintains functions from the camera that help control peripheral brightness and correct transverse chromatic aberration, distortion, and more. It is ideal for photographers who use different camera systems depending on the subject as well as amateur photographers who enjoy using a variety of camera systems. For video users, please see the Notes tab about AF. It will physically pair with any EF (not EF-S) mount lens but full compatibility might be lacking. Experiment at your own risk. It will physically also pair fine with E mount video cameras like the FS7 and FS5 but full compatibility might be lacking. Experiment at your own risk. 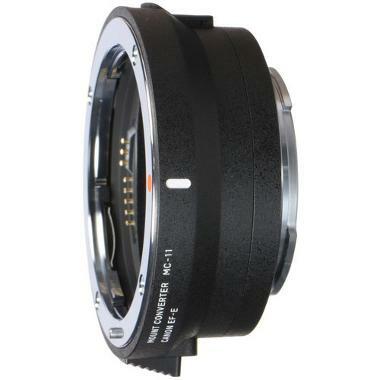 • Manual focus is required for video when using this adapter. It will autofocus but slowly. • For this adapter to perform at its best, please ensure that your Sony camera is on the latest firmware. • This adapter does support in-lens image stabilization for those lenses listed above that have OS.